This code sample will save one or more selected Outlook email messages as a PDF file. 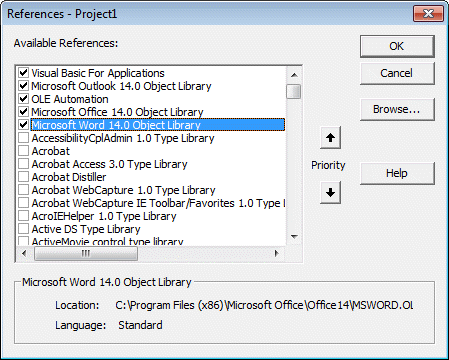 Because it uses Word object to save, this code could easily be tweaked to save messages in any format Word can save as. A version of this macro to use in a run a script rule is here. This version of the macro saves the message without the short To/From/subject headers normally found at the top of a printed message. browser = "C:\Program Files\Internet Explorer\iexplore.exe"
tmpFileName = tmpFileName & "\" & sName & ".htm"
To save the message as a Word Document using the DOCX file type, replace the code blocks that saves as a pdf with the code below. Print Email (and Attachments) on Arrival has a list of utilities that can print messages and attachments. Is there a way to have the message saved as DOCX directly to a specified folder without any prompts? You can use a macro - an automatic startup macro will save all as they arrive or you can use a manual one - select the message, push a button. Either can be preconfigured to use either a hardcoded path. Thank you, using the code what changes can I make to save it so a path? strToSaveAs = MyDocs & "\" & sName & ".docx"
strToSaveAs = "c:\The new path\folder\subfolder\" & sName & ".docx"
Diane thanks for the replies, I changed the code as seen below. However it still save to Documents and not the specified folder. Im guessing it has to do with the 'Mydocs = wshell.special folders' line. strToSaveAs = "C:\Users\gonzae50\Documents\NEWVITALIZEEMAILS" & sName & ".docx"
Do you know what I can do to get it to the folder? Thank you SO MUCH for all the amazing help! Just an FYI the path has all the "/" not sure why they didn't come across on the pasting of the code. Use a trailing slash in the strtosaveas path: Documents\NEWVITALIZEEMAILS\"
how can I change the file saving naming convention to the Sent on date in the format "yyyy-mm-dd-hh-nn-ss-subject"
I often get an error with the .mht file still being open and not closing. This often happens if you run the script multiple times on the same email, but will also do it randomly. More importantly, when I restart my computer, several word documents open. It's as if the email is converting but the file stays open in the background, maybe in a temp file? One last thing, If you run the script on the same email multiple times, it doesn't create another version. It says errors. I thought adding the date format after the name, as it looks like you did, but I couldn't get yours to work, nor mine. Windows 10? There is an option to reopen apps that were open when you closed Windows. I'm guessing that is the reason they reopen. Change this in Settings > Accounts > Sign-in Options to finish setting up apps after logging in. That should be because the file already exists. Does it work if you use Now for the date? I have been using this script and the rule version of it for months. But all of a sudden I came into work this morning, and it's freezing outlook until i pull up task manager and find the WINWORD.EXE *32 process and end it. It is creating these and not closing them? The date is June 4th 2018. I'm not sure why i'm getting this error now, when in the past it's been fine. Hi Dianne - me again! Run-time error '-2147467259 (80004005)': The export failed due to an unexpected error. What version of Office, Windows do you use? I can't find much information about possible causes for that error - but what i found involved Office 2007. I'm still looking for solutions. Also, what pdf application do you use? This is the only comment I've found so far that the affected user said worked: "I uninstalled Foxit Reader and installed Adobe Reader 9 and rebooted..."
I don't think the error message points to the filename, but triple check t o verify it is valid. I use Adobe Acrobat Reader DC. what do i need to check with the filename? The odd thing is it works fine after a reboot but then finally stops so i need to reboot? I'm not sure what you need to do - there is so little information out there, at least that I've found. Hi Diane. Just found i have an error with Word - some fonts it does not like - says there is not sufficient memory space to display the requested font. How do I change the font in the script to run as a rule? This script doesn't use fonts - the message and files would use the default fonts for word or the one used in the email. Is me again. I trying to do it again in a new company environment. This time, when i try to choose the script in the Rules, i can't find the any record there. Do you have one or more messages selected? That error basically says it can't find email in the selection. Also, it needs to be actual email messages, not read receipts, NDRs, meeting requests etc. Oh... make sure the path is correct.